had been presenting at the national astronomy meeting in Portsmouth. I thought given the interest I should write something about it here. So far at the LHC in Geneva they have discovered the higgs boson and nothing else that they hadn’t already seen. The higgs boson is the final piece of the jigsaw puzzle we refer to as the standard model of particle physics which contains all the particles that we definitely know exist. Without the Higgs the theory wouldn’t make sense. We expect other particles to exist that we haven’t seen before, notably dark matter which we are pretty sure exists and we are looking for in laboratories and in space. However if you just take the particles that we DO see, there is something s bit funny about the higgs field. You may have heard that the higgs field is “switched on” throughout the universe. That means that even in regions of the universe that are completely empty the higgs field has a particular non-zero value, which gives rise to masses for the other particles as they move around. The value is 246 GeV (where GeV are Giga electron volts – the units of particle physics). The reason for this is there is a potential energy for the higgs field which has a minimum at 246 GeV. This is why the top quark, which is the heaviest quark we know, has a mass around 173 GeV which is 246 GeV divided by the square root of 2 and is the heaviest a quark could be that gets its mass from the higgs. The funny thing I was talking about earlier is that this minimum of the potential is not the only minimum for the higgs field, there is another one at a much higher value due to quantum effects (around a hundred milion GeV depending on the precise value of the masses of the top quark and the higgs boson mass, which tells us how stiff the higgs field is to ripples). If the higgs field in our universe was to exist in this higher minimum then all the quarks would have very high masses indeed! It would certainly look a lot different to our own universe. What is more, the energy of the potential in our current 246 GeV minimum is only infinitessimally larger than zero and gives rise to the gentle acceleration of the Universe we refer to as Dark Energy (we have no idea why it is so close to zero). The energy density in this higher minimum would be negative, which would presumably make the Universe quickly collapse. So on the whole, for a variety of reasons its a good job we are in our 246 GeV minimum and not the higher one! Separately the BICEP2 experiment has come out and said that it has detected evidence for polarisation of the cosmic microwave background radiation that is compatible with a period of rapid expansion of the very early Universe known as inflation. Not just any old inflation, but inflation with a high energy density that would make the universe expand EXTREMELY quickly as opposed to just VERY quickly (I lack the adverbs for such rapid expansions). This rapid inflation would lead to quantum fluctuations in all the fields in the Universe at that time, including the higgs field, and if the expansion was that quick, the higgs field would have been bumped into the higher minimum where the Universe collapses. It is really important to point out that we are not the first people to think about this, in particular this paper by two very clever Italians and one clever Spanish guy, all of whom I got to know when I worked at CERN, looked at the same thing. We did a very similar calculation using the latest values from the LHC and from BICEP2. 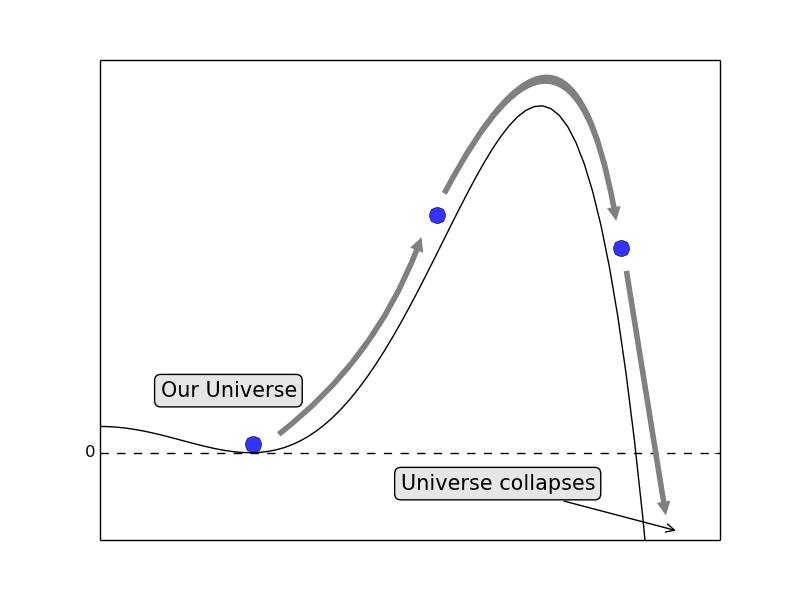 So why hasn’t our Universe collapsed? Well this is just telling us that if BICEP2 is correct then there has to be some new physics which will come in and change the quantum theory and get rid of the higher, dangerous minimum in the Higgs potential. We expect new physics to exist, I mentioned dark matter, but we also need to explain where neutrinos get their masses from and why there is more matter than anti-matter and all these things need new physics that could help decide whether the second minimum exists or not. Still it would be nice to know that this extra physics has to exist otherwise the Universe will collapse. It would be a great motivation to keep looking. The trouble is now people don’t know if the BICEP2 team are actually seeing polarisation signals from the big bang or from some boring dust in the Milky Way and we are all just going to have to wait to find out which. Insightful comments shedding light on the recent social media buzz about the Higgs, BICEP 2 and the possibility of the universe collapsing, from the co-author of the original paper, Dr. Malcolm Fairbairn.